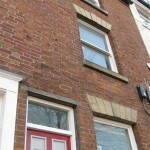 A typical Sheffield terrace property hides a number of secrets, can our students piece together what happened? 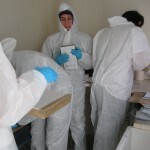 This week the first year and MSc Forensic Science students at Sheffield Hallam University had the chance to practice the skills they have been honing in the lab in our ‘crime scene house’. The students get fully kitted out as they would be at a scene. 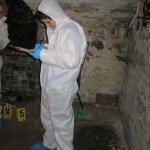 Under the watchful eye of our expert crime scene investigator (CSI) Gary, with 25 years of experience in the local police force, the students took part in a practice scene evaluation then assessed scene. 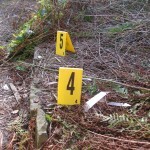 The students were assessed on their ability to manage the scene, take notes photos and sketches and package evidence. 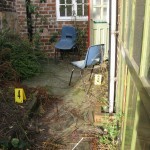 After the practical the students will have to complete a witness report, just as if they were working for the Police. 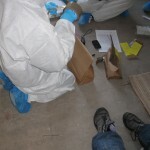 In future years the students will get the chance to take the evidence collected at the house back to the labs to undertake further analysis. This maybe looking for fibres, paint or DNA for instance. The kitchen has been broken into from the garden – how did the criminals gain entry into the property and what evidence can be found? 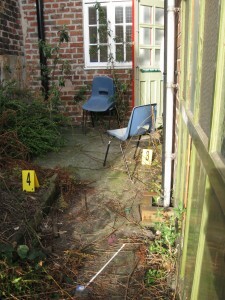 This scene involved some outdoor work to check the back gate and windows for evidence and flower beds for foot wear marks. The householders handbag has been taken from the table. This is one of the most common type of crimes encountered by CSIs. 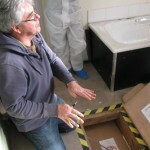 From the break in it may be possible to colect fingermarks, fibres, blood and various other types of evidence. 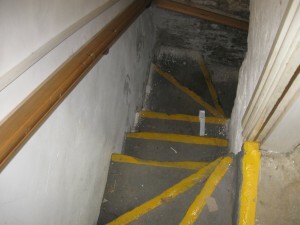 Into the house and stairs lead down to the basement. 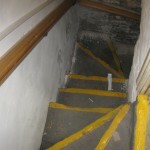 A dog was secured just around the corner and was used to keep a hostage underground for several days. Items have been left behind by the hostage takers, including coffee cups and cigarette butts. A hat worn by the hostage taker may have significant amounts of evidence on it. Upstairs the bathroom and bedrooms hold further secrets. 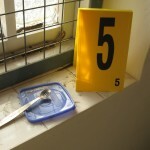 Evidence of drug dealing, including firearms, money and white powders were found in the bathroom. A suspicious death in the bedroom requires investigation, with bottles and pills scattered everywhere. 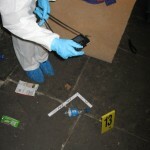 This practical is always well received by the students as it brings together the crime scene elements of the course. The students get into teams, electing different roles within the team. Some are designated photographers, some take sketches and scene notes. the way the team works together is crucial to getting the job done in the time available, without compromising the evidence. One of the perks of the practical is the students get to keep the suits, masks and foot covers, which seem to turn up at parties for the rest of the year! This sounds like brilliant fun! Bet you could sell this to offices etc as a Christmas party with a difference… it would be a great ‘team bonding’ exercise for corporate types too… and how about CSI stag/hen nights? The possibilities are endless! If they ‘crack the case’ they could have champers with the ‘corpse.’ I may be getting carried away as I want to book my place NOW! It is fun and working together could certainly be a team building exercise! Maybe we would need more gore to sell it? Good idea! 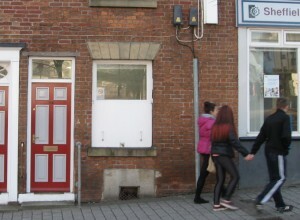 Tell you what Dr Tom, there’s money to be made here: get Simon Cowell on the phone and tell him that you’ve got the perfect set-up for ITV’s next “so bad it’s good” ratings extravaganza – Celebrity CSI ‘Through the Kitchen Window’ Cluedo live from Sheffield’s Crime Scene House! I can see the pilot episode now with a series of local celebs: Sean Bean in the role of Colonel Mustard, Jarvis Cocker as Professor Plum, Peter Stringfellow as Rev. Green, Leslie Ash as Mrs White, Jess Ennis as Ms Scarlet and Eddie Izzard as Mrs Peacock (obviously)! Lloyd can host (to save you from voiceover duties) and you can be the show’s Suzie Dent giving “Dr Tom’s Top Tips for Failsafe Forensics” (complete with the deerstalker if you please)! CSIdol? Already got the DexFactor (http://www.weareforensic.co.uk/my-1st-post/). You missed Prince Naseem (starting a fight in the alleyway) and the Artic Monkeys (in the cellar with the discarded coffee cups). Hmmm off to buy a deerstalker now…. How about a pipe too?